Tshepang Tlale is the youngest black female South African to win the Woman International Master title in chess. Wits University student Tshepang Tlale will be representing South Africa at the African Individual Chess Championship in Zambia later this month. The annual competition brings together previous World Chess Federation champions and this year’s gathering will host competitors from a number of African countries. 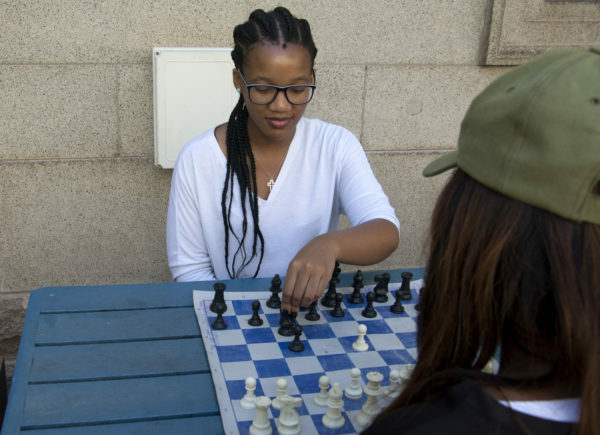 Tlale, third-year BA student, has been playing chess since she was three years old. “It is my sister who taught me how to play. She, too, learned to play chess at the age of three and was taught by our mother, who played chess when she was still in school,” said Tlale. In 2011 she became the youngest South African to earn the title of Woman International Master (WIM). According to the World Chess Federation (FIDE), WIM is the second highest title awarded to female chess players. “I became the youngest black South African female to earn the title of Woman International Master (WIM), which was truly an honour given that I was only 13 years old at the time”, said Tlale. She added that “Out of all junior women chess players in Africa, I was the number one, which is precisely how I earned the WIM title.” The title also gave Tlale automatic entrance into the African Individual Chess Championship this year. At the age of 11, Tlale captained the under-12 South African girls’ team which represented South Africa in Vietnam during the World Youth Chess Championship. She has continued to be ranked in the top 30 globally and as a result, out qualified her age group by the age of 17. It was at the age of 17 that she represented South Africa in the World Chess Olympiad in Norway and won 7 out of the 10 rounds. Choko said that Tlale’s personality when playing chess is very different than her actual personality. “Although this is not in her true nature, she is a very aggressive player on the board and also tends to be decisive and positional,” Choko added. The coach is very confident that Tlale is going to come out victorious in the Zambiam tournament. “She is a clear winner. She was number four in the 2011 Mozambique tournament, and now that she is older, she has more focus and will definitely win,” Choko concluded. Before going to Zambia for the competition which runs May 11-24, Tlale needs to raise R30 000 for her travel and board. For information about the donation, you can email tlalechess@gmail.com. Wits Vuvuzela: Wits kicks women’s rugby into touch, April 25, 2018.